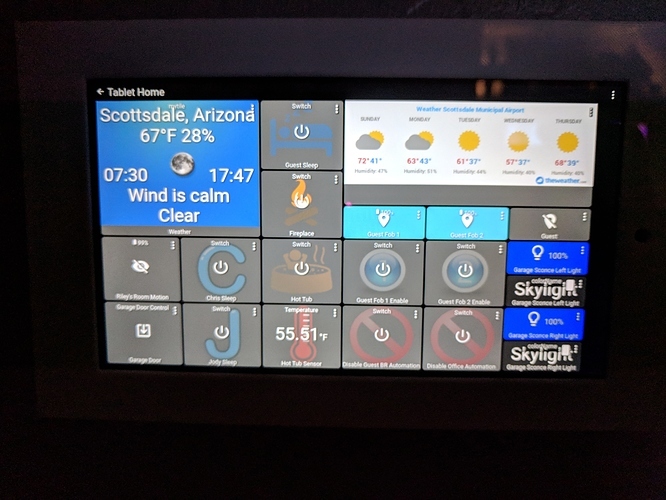 Is there a way to get more weather data on a Dashboard? I have chosen the Temperature Tile to start and it is reporting in F instead of C, which is my system preference . add other tiles or use the mytile attribute? set the imperial units to false in driver settings. Apologises for the ignorance on this side how do I ' use the mytile attribute'? I have searched the forum for examples without success. Go to your Device Details page for your Weather device. (You created a virtual device and then picked the ApiXU driver.. that one, that device.) On the right side is a tall stack of Current States. Those are Attributes you can enter into a Dashboard Tile. On your Dashboard, pick your device, then pick attribute, and a third field shows up. Paste in the attribute you desire. "mytile" in this case. Careful of capitolization, it needs to be an exact match. Click Update Tile. 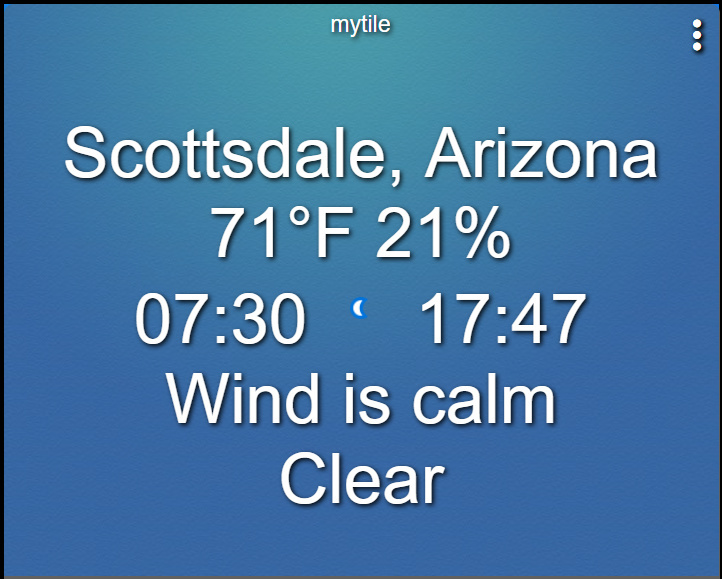 I just updated to the latest code and added mytile to a dashboard. The condition_icon image is tiny between the sunrise and sunset text. Is this because of my dashboard layout settings? I'm assuming nothing can be done in the driver? I had visual attribute in a separate tile before and it looked good, what would I have to do to the mytile code to get "visual" instead of "condition_icon"? code updated to github with new image size … is that any better? Off Topic. But what size tablet is that? Is there a way to change the font size of a template, like attribute I wonder whether it is on desktop or mobile? Also, I found a weird thing for Apixu. When I use city name for API, it provides correct temperature and feels like, but when I use postcode or coordination (Long, Lat) , returned same number for temp_c and feelslike_c. Dark Sky's Terms of Service explicitly forbid asking end-users to get their own Dark Sky API key. I looked over that thank you. So you can change the Font Size on a per Dashboard basis. Is there a way to vary size per tile? this worked great for a little while on sharptools but sharptools is not grabbing all of the correct values from the driver anymore. I am installing the tile as a Thing and selecting the weather device i created with this driver, all of the values are showing on sharptools dashboard tile but they do not match up with the values showing in hubitat when i do a POLL. 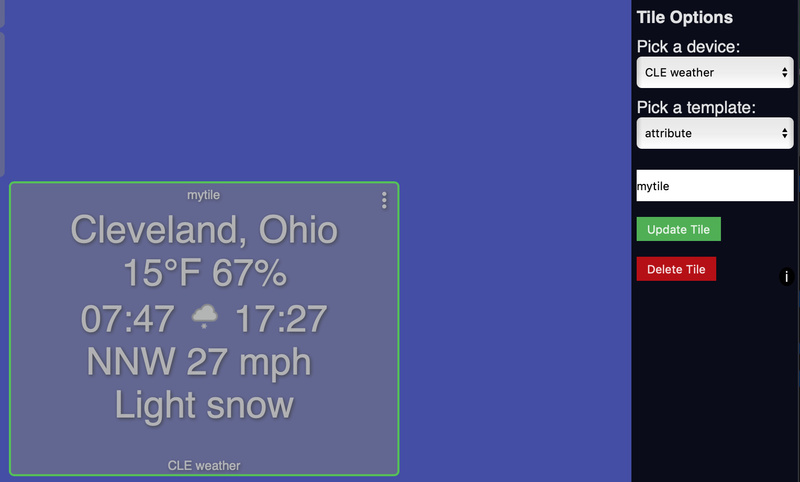 EDIT: I got an answer from Sharptools, They are working on better integration with weather tiles and hubitat. Hi Jason. I responded to your post over on the SharpTools community - I was a hair too slow to reply before you got this post in! We are actively working on an update to the SharpTools-Hubitat integration which should get this working as expected (more details in the linked post below). I have an initial update working on my development hub / SharpTools.io instance... behind the scenes it's a relatively big change, but it will also enable some other cool features, so I'm excited about getting it fully tested and through the release cycle. FYI: my plan had been to support selection of attributes that the driver publishes from the 40 or so attributes that the driver always publishes today. unfortunately HE does not support multi-select from input list in drivers … which i found out after implementing the changes in the driver code to allow selection of attributes to publish. so plan abandoned … at least for now. What was the goal...reduce the number of attributes? To what end? Perhaps you could use a text input. Default to all fields and have it as a string concatenated array of the fields to publish based on the entered list. Fall back to the default set in the event of an error parsing the entered list.